You are here: Australian Herbicide Resistance Initiative › News › Chaff lining…too good to be true? How often do we hear comments like “you get what you pay for” or “it’s too good to be true”? Well, chaff lining just may be the exception to those comments. Chaff lining has been on a rapid rise to glory in the Harvest Weed Seed Control (HWSC) scene over the past two seasons. A survey of WeedSmart subscribers showed the percentage of growers using chaff lining increased from 6% in 2016 to 26% in 2017. Researchers would be stoked with this level of adoption, but the curious thing was that there was really no research data available specific to chaff lining. Adoption seemed to be based on grower experiences (much of which was shared on Twitter) and the fact that chaff lining is the cheapest HWSC tool to set up at $6.40/ha (compared with the next cheapest at $7.10/ha for chaff tramlining and $12.80/ha for chaff carts*). *Figures sourced from AHRI Insight ‘Spoiled Rotten – the sequel’. Note the capital cost of chaff lining is based on a kit commercially available from Westoz Boilermaking, many growers are making their own kits at very low cost. So, at $6.40/ha, do you get what you pay for? Is it too good to be true? 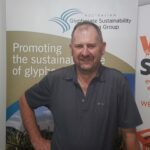 Well, now we have some compelling research data coming through for chaff lining and it seems you get really good value for money and it is true – chaff suppresses weed emergence. Chaff type can influence weed emergence, depending on the chaff proportion of the crop. It’s impressive research for just one year, isn’t it? Ok, so in reality, we know not all weed seeds are going to be suppressed in chaff lines, particularly those with limited chaff on top. However, confining weed seeds to concentrated bands in the paddock, where a proportion are physically prevented from emerging, another portion is potentially destroyed by rotting and the remainder emerge to become sitting ducks for targeted weed control, has got to be a good thing! In all trials, increasing amounts of wheat chaff reduced annual ryegrass emergence. 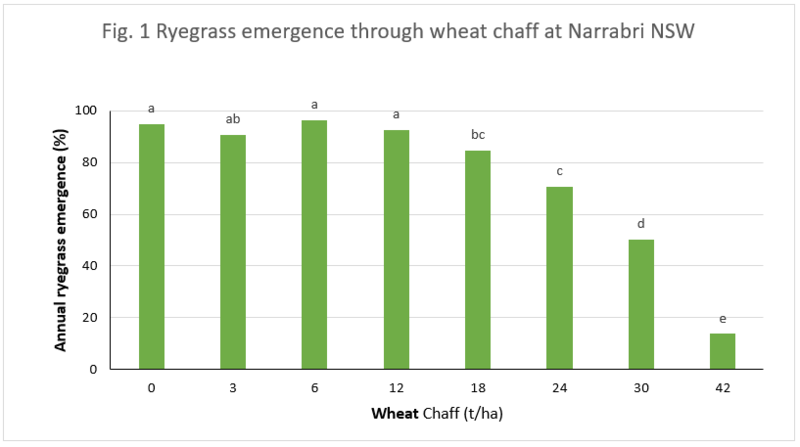 At the highest rate of 42t/ha chaff, annual ryegrass emergence was reduced by 43-81% across the sites, compared with nil chaff (eg. Narrabri – Fig 1). However, the results also showed that lower chaff rates can still have an impact on ryegrass numbers. 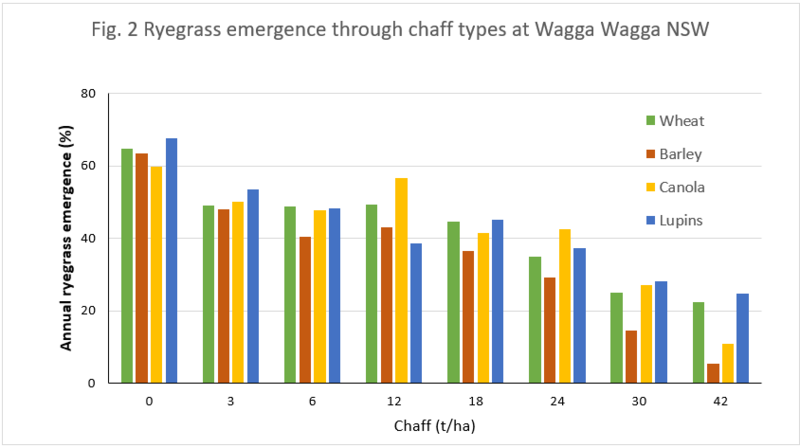 At Wagga Wagga, just 3t/ha chaff significantly reduced ryegrass numbers, while at Narrabri and Toowoomba the thresholds were 18t/ha and 24t/ha chaff respectively. To put this in perspective, approximate grain yields to produce 3t/ha and 24t/ha chaff are 0.25 t/ha and 2t/ha respectively (assuming 30% chaff proportion and a 12m front). Common sowthistle was also assessed in the Toowoomba trial. Similar to ryegrass, increasing quantities of wheat chaff reduced sowthistle emergence, but emergence declined steeply at 12t/ha chaff with almost no germination at 18t/ha and greater. It’s important to remember that these trials were conducted in pots/trays where weed seeds were placed on the soil surface and chaff placed on top as a physical barrier. Field trials were established in 2017 to monitor rotting of weed seeds in chaff lines (and chaff tramlines) over time, with results still being assessed. 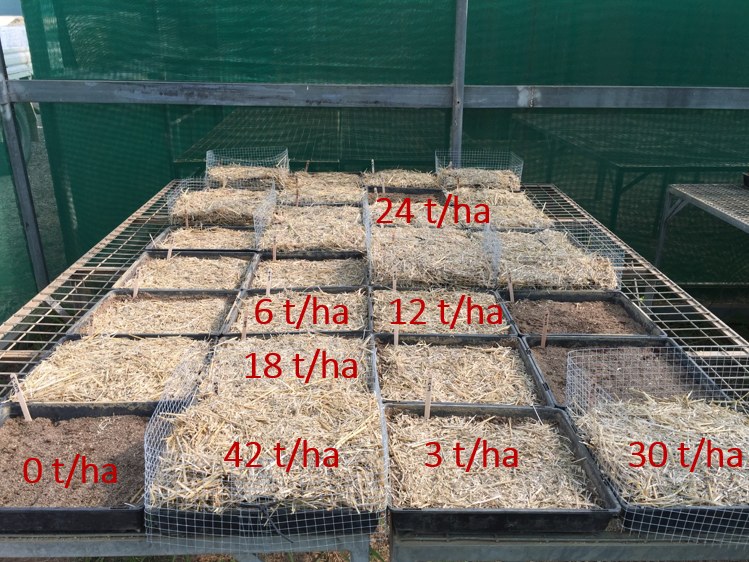 To see if crop type influences ryegrass emergence, three other chaff types (in addition to wheat) were assessed in the Wagga Wagga trial, again using chaff rates up to 42t/ha. As with wheat, ryegrass emergence decreased as quantities of barley, lupin and canola chaff increased. Of the four crop types, weed emergence was lowest under barley chaff (Fig 2, see linked paper for statistical analysis). Interestingly, barley was also compared with wheat chaff in the Toowoomba trial and showed no difference in ryegrass suppression, except at the highest rate when wheat chaff almost completely suppressed ryegrass emergence. Variation between crop types/varieties is likely to occur due to differences in chaff percentages. Although research has shown wheat chaff represents approximately 30% grain yield, this may not be representative of other crop types. Determining the chaff proportion of other crop types is on the agenda for the research team this summer! There’s still a lot to learn from chaff lining research but early indications are very positive. As experience has shown, chaff lining does not provide 100% control and growers need to be prepared to see a strip of weeds in their crop, particularly in high-pressure paddocks. This research suggests that as growers persist with chaff lining for a number of years, weed suppression will improve as chaff residues build up. Perhaps chaff lining will be the HWSC tool where we get more than we pay for. Time will tell. Chaff lining vs chaff tramlining? Originally known as ‘windrow rotting’, chaff lining has been championed by WA grower Mic Fels. The concept involves funnelling the chaff fraction of crop residue (containing weed seeds) into a confined row directly behind the harvester using a narrow chute. The chaff and weed seeds are then left to rot down over time. To promote rotting, the chaff lines need to be placed in the same location year after year by running the harvester on a CTF system. Chaff tramlining is a similar concept, but the chaff fraction is diverted through a chaff deck onto permanent wheel tracks in a CTF system. Wheel traffic creates a hostile environment that inhibits weed seed germination.